PORTLAND, Ore. - Google has acquired 74 acres in The Dalles, making room for the company to add considerably to its growing data-center campus along the Columbia River. The Dalles was home to Google's first corporate data center anywhere, opening back in 2006. The company steadily expanded on that original site and held a ceremonial groundbreaking Thursday on a new, $600 million facility near its original site. 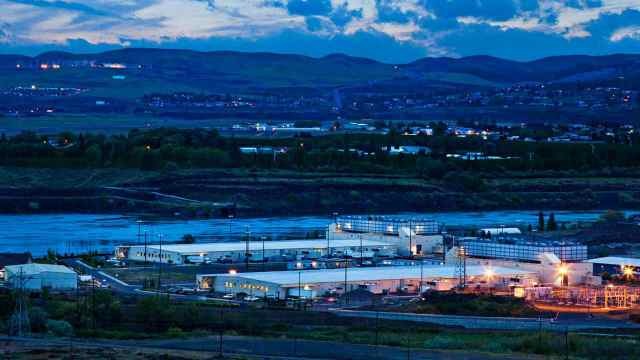 It will bring Google's total investment in The Dalles to $1.8 billion, consisting primarily of the expensive computers running the data centers. Google said it bought the new acreage from Northwest Aluminum, which operated a smelter nearby until 2000. Google didn't report terms of the deal and Wasco County said the sale price has yet to be recorded with the assessor's office. Google's new property had been used by the Fort Dalles Rodeo Association since 1975, according to The Dalles Chronicle. The Chronicle reported the rodeo doesn't plan an event this summer but may continue to hold events on the site in future years while it looks for a new, long-term home. The new, 10-million-cubic-foot data center now under construction is on 23 acres acquired last year from the Port of The Dalles. The port's industrial land is nearly exhausted, so buying Northwest Aluminum's land gives Google room to continue growing. "We don't have plans to build on this piece of property in the immediate future, but we want to ensure that we have options to continue to invest in The Dalles in the future if our business demands it," Darcy Nothnagle, Google's Northwest head of external affairs, said in a written statement. Oregon is among the most popular destinations in the country for large data centers, largely due to local tax breaks that exempt data centers' computers from local property taxes. Facebook, Apple and Amazon all have large facilities in eastern or central Oregon, and all are expanding those operations. Last year, Wasco County valued Google's exemption just shy of $6.9 million. The company compensates the county with negotiated fees that partially offset the tax savings - those payments will total nearly $2.2 million annually with the new data center now going up. Additionally, franchise fees generated by Google's electricity use currently account for about 6 percent of The Dalles' general fund. Google estimates that total will rise to 10 percent when the new data center opens. Approximately 175 people work in Google's data center in The Dalles, about half of them contractors. The company says employment could increase by about 50 when the newest data center opens next year.